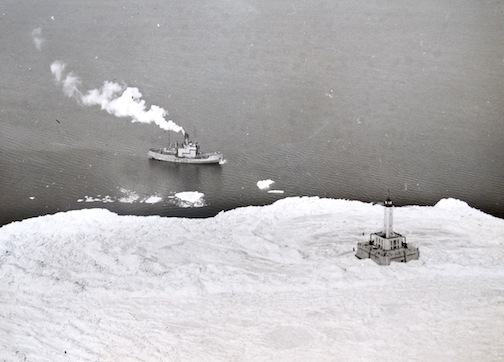 Screwpile lighthouses were very vulnerable to icy conditions. After many were damaged or swept away in ice flows, they were replaced with lighthouses built on sturdier caisson foundations. The extremely critical conditions due to prolonged and severe cold and resulting ice conditions along the North Atlantic seaboard have placed in serious jeopardy many aids to navigation, both fixed and floating, particularly in Chesapeake Bay and its tributaries . . .
King goes on to mention that the Janes Island Lighthouse, near Crisfield, Maryland was destroyed; however, the keepers had previously abandoned the station for their safety. Personnel were evacuated from Tangier Island, Point No Point, Ragged Point, Tue Marshes, Love Point, and York Spit Lighthouses. Sixty-one minor lights had been destroyed before the end of January. Article from the Washington Herald on the same day King wrote his his memo to the Commerce Secretary. 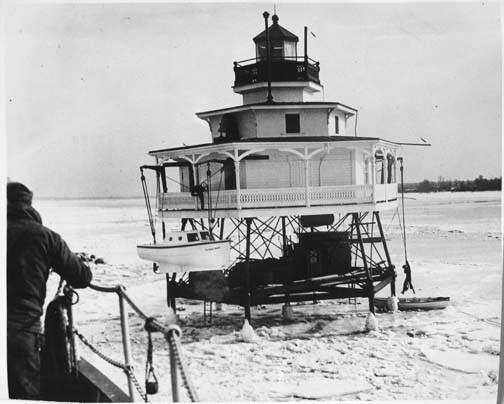 An article in the Baltimore Evening Sun, also dated February 11, reported that “Five Eastern shoremen tied together with ropes, yesterday crossed the ice to the Love Point light to bring the keeper ashore.” The lighthouse tender Violet was able to reach Seven-Foot Knoll and remove its keeper but had to return to Baltimore before nightfall without visiting any other lights. A press release dated February 12, 1936, reported that on February 9th, the War Department sent a plane to survey conditions and communicate with keepers still at their stations. 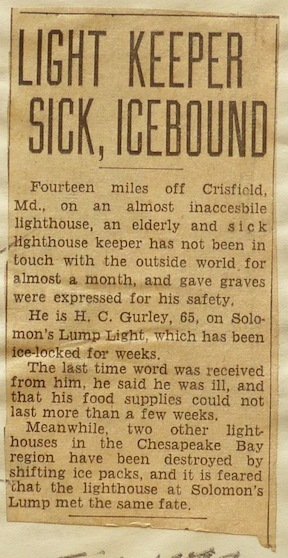 At that time a supply of food had been dropped for Keeper H.C. Stirling at Solomon’s Lump Light. Conditions were described as the worst since 1918, when several stations were swept away. Source: National Archives Record Group 26 Entry 50, File 3655. A USCG tender services Minneapolis Shoal Light Station in Lake Michigan in 1944. Keepers were taken off offshore lighthouses in the Great Lakes when navigation closed for the season. National Archives photo. This entry was posted in Historic images, Lighthouse keepers on February 21, 2015 by lighthousehistory.